Sweeney Opera House was on the South West corner of East 1st and McLeod, across McLeod Street from Independence Hall. It was formally opened on May 14, 1904. A maple floor was added in 1912, which was apparently a big deal, as it is often mentioned. In addition to shows, Sweeney's was also used for other activities, including sports, as the school did not have a gym at the time. In 1935 a skating rink opened there, and continued on and off at least into 1937, and again in 1944 and 1948. The California Theatre was in Sweeney's temporary in 1931 while major repairs were made to its building (now the Theater Mall behind the Schenone building) following a fire. In October 1938, the name was changed to the Palm Ballroom. In 1939 Viale's Market opened in a portion of the building and remained until the fire. The ballroom was still used for events. In 1944 Cresta Blanca held a "Turkey Party". In 1946 Carol Jean opened a dance studio there. 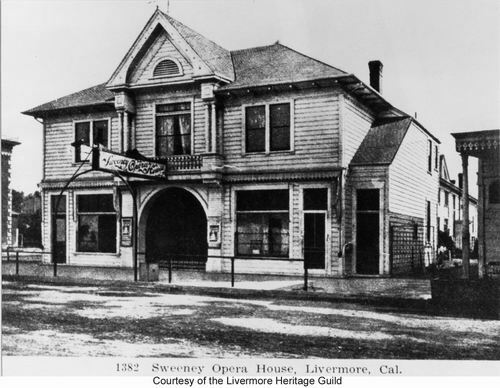 The Sweeney Opera House burned in November of 1948, and was being used for events up until the day of the fire. Sweeney Opera House. Note the corner of Independence Hall on the far left. John Sweeney's house is on the right. It appears to be one story in this photo, but it is difficult to tell. 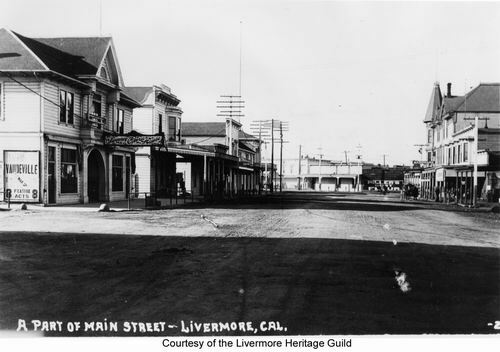 The Judges for a Livermore Horse Show, March 7, 1908, in front of Sweeney Opera House. Left to Right: McNally - had a winery & vineyard; Christensen - ran the Altamont Hotel; Berlin, had a saloon & restaurant in Independence Hall; Gorner, Sold furniture & ? 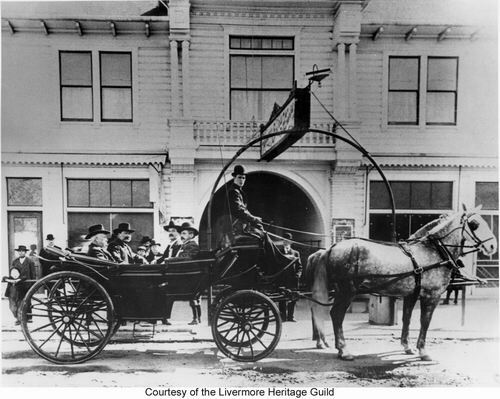 ; Driver, Gene Day, owned a Livery stable. 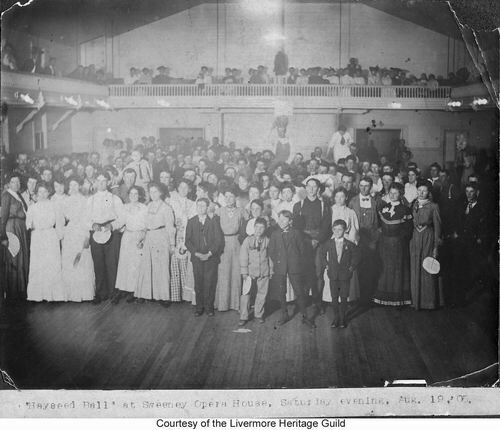 Inside the Sweeney Opera House, at the Hayseed Ball on August 19, 1905. Sweeney's Opera House is on the far left. Note the Vaudeville sign on the side of the building. It reads "Vaudeville, Mar 7, 8 Feature Acts"
John Sweeney's house is to the right of the Opera House. This picture is probably later then the previous ones. The Sweeney house is 2 story here while in the top picture it looks like one story. The telephone line in front does not appear to be there in the top two pictures.